This blog is dedicated to the significant roles birds play in our everyday lives. Testimony to our feathered friends’ importance, of course, already lies in the many websites that provide tips for birdwatchers, instructions for setting up bird-feeding stations, and forums for photographs and first-person accounts from birders. Such online resources offer abundant materials for learning more about these wonderful winged creatures. 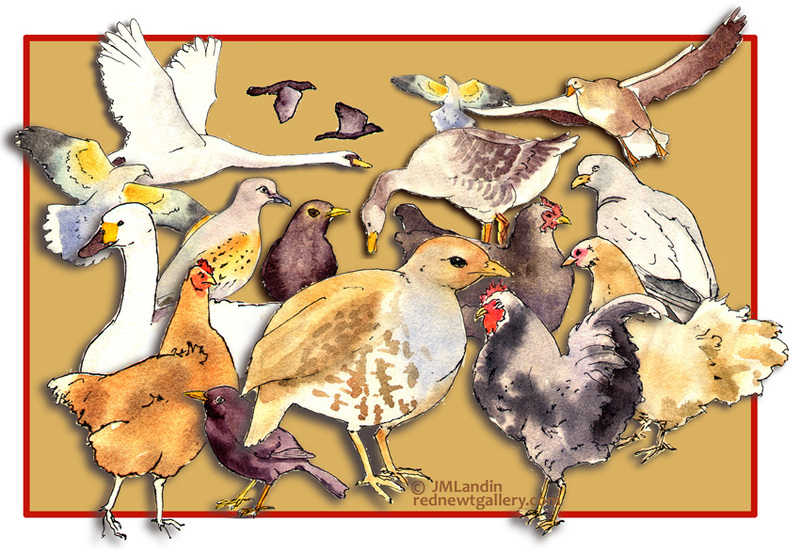 But this blog seeks to make something available online that’s a little different but also essential, focusing instead on the cultural influence of birds upon human society and the numerous ways in which they have enriched and continue to impact our world. We exist with all things, including birds, in relationship, and not in a vacuum or isolation. So the weekly posts here will seek to explore how our current and historical depictions of birds can help us better understand ourselves, appreciate their influence, and improve our interaction with them. After all, humans’ relationship with class Aves is extensive, spanning back further than civilization itself. Evidence from diverse locations ages ago reveal how birds influenced the earliest forms of art and religion. Ornithologist Tim Birkhead explains, “Images of birds decorate the walls of European caves; in Africa the forms of birds were chipped out of slabs of hot, red sandstone; and in Arctic chambers the skulls of great auks were placed alongside the dead to accompany them to the next world” (1). Over time, ideas about birds developed throughout all cultures into countless myths, legends, and superstitions. Birds also figure prominently in world literature, religious scriptures, and other stories. In the Bible, we find several instances, such as Noah’s dove (Genesis 8:8–12) and Elijah’s ravens (I Kings 17:2–6). Other notable examples exist in Aesop’s Fables, the Buddhist Jataka, Ovid’s Metamorphoses, Persian poet Farid ud-Din Attar’s Manṭiq-uṭ-Ṭayr (The Conference of Birds), and tales collected by Hans Christian Andersen (e.g., “The Ugly Duckling”) and the Brothers Grimm (e.g., “The Six Swans”). Even William Shakespeare’s plays frequently refer to bird folklore. Poets, of course, have long been fascinated by birds. Nobel laureate Pablo Naruda dedicated an entire book to them with his Arte de Pajaros (Art of Birds). One of Ted Hughes’ most well-known books remains his Crow: From the Life and Songs of the Crow. His wife Sylvia Plath, however, seemed drawn to the rook, another member of the Corvidae family, which appears in at least four of her poems. Perhaps the bird best known from poetry remains the nightingale, memorialized in classical mythology and having inspired important works by T. S. Eliot, John Keats, Samuel Taylor Coleridge, and John Milton. Folktales and legends about birds have also informed classical music masterpieces, including P.I. Tchaikovsky’s ballet Swan Lake and Richard Wagner’s operas Seigfried and Lohengrin. Also, some songbirds even have interesting connections to famous composers. For instance, Wolfgang Amadeus Mozart had a pet starling that could sing part of his Concerto in G Major (2, 3). Antonio Vivaldi found the European goldfinch a worthy enough muse to name a flute concerto for it (Il Gardellino). And British musician David Hindley has discovered similarities in the skylark’s song with aspects of Ludwig van Beethoven’s Fifth Symphony and the woodlark’s with J. S. Bach’s The Well-Tempered Clavier (the 48 Preludes and Fugues) (4, 5). Humankind’s affection for birds has infiltrated just about every aspect of our culture, including movies, fine art, advertising, sports, common idiomatic expressions, and pop songs. It also has impacted history in some interesting ways. So this blog will not just be another website on birds. It will look at how we humans view our winged neighbors, hopefully illustrating the many invaluable functions that birds provide for us. Birkhead, T. The Wisdom of Birds: An Illustrated History of Ornithology. New York: Bloomsbury USA, 2008. p. 3. West, M.J., and King, A.P. “Mozart’s Starling,” American Scientist, 1990, 78: pp. 106–14. Lederer, R. Amazing Birds: A Treasury of Facts and Trivia about the Avian World. London: Quarto Publishing, 2007. pp. 23, 52. Davies, G.H. “Bird Songs,” PBS: http://www.pbs.org/lifeofbirds/songs.